Robin Youngs, Edward Fisher,	The Journal of Laryngology & Otology, Volume 127 Issue 4, p 331. N Andreou, S Hadjisymeou, J Panesar,	The Journal of Laryngology & Otology, Volume 127 Issue 4, pp 332-338. M Hoa, J W House, F H Linthicum, J L Go,	The Journal of Laryngology & Otology, Volume 127 Issue 4, pp 339-348. G Thiel, RP Mills, N Mills,	The Journal of Laryngology & Otology, Volume 127 Issue 4, pp 349-353. Type I tympanoplasty with island chondro-perichondral tragal graft: the preferred technique? E De Seta, D De Seta, E Covelli, M Viccaro, R Filipo,	The Journal of Laryngology & Otology, Volume 127 Issue 4, pp 354-358. 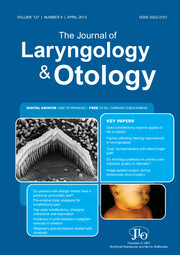 A A Melo, S S Caldas Neto, F S Leão, A J C Campos,	The Journal of Laryngology & Otology, Volume 127 Issue 4, pp 359-363. Do rhinology care pathways in primary care influence the quality of referrals to secondary care? N Su, P P Cheang, H Khalil,	The Journal of Laryngology & Otology, Volume 127 Issue 4, pp 364-367. V S Sunkaraneni, D Yeh, H Qian, A R Javer,	The Journal of Laryngology & Otology, Volume 127 Issue 4, pp 368-377. Do patients with allergic rhinitis have a particular personality trait? H Vamanshankar, K S Hegde, J Chaturvedi, C B Pratibha, A Ross, R C Nayar, S Parameshwaran,	The Journal of Laryngology & Otology, Volume 127 Issue 4, pp 378-382. A M A El-Fattah, E Ramzy,	The Journal of Laryngology & Otology, Volume 127 Issue 4, pp 383-391. W A Clement,	The Journal of Laryngology & Otology, Volume 127 Issue 4, pp 392-398. C Schweiger, P J Cauduro Marostica, M M Smith, D Manica, P R Antonacci Carvalho, G Kuhl,	The Journal of Laryngology & Otology, Volume 127 Issue 4, pp 399-403. Y M Bhatt, N Pahade, B Nair,	The Journal of Laryngology & Otology, Volume 127 Issue 4, pp 404-407. J S Virk, P S Randhawa, S R Saeed,	The Journal of Laryngology & Otology, Volume 127 Issue 4, pp 408-410. A K Ebrahim, J W Loock,	The Journal of Laryngology & Otology, Volume 127 Issue 4, pp 411-414. C-L Kuo, Y-B Yu, W-Y Li, Y-L Lee,	The Journal of Laryngology & Otology, Volume 127 Issue 4, pp 415-418. K Tsioulos, M Martinez Del Pero, C Philpott,	The Journal of Laryngology & Otology, Volume 127 Issue 4, pp 419-422. S Meghji, O Judd, E Carr,	The Journal of Laryngology & Otology, Volume 127 Issue 4, pp 423-425. T A Jacques, M P Stearns,	The Journal of Laryngology & Otology, Volume 127 Issue 4, pp 426-428. S Murono, Y Nakanishi, M Fujimoto, T Yoshizaki,	The Journal of Laryngology & Otology, Volume 127 Issue 4, pp 429-431. J Dolezal, J Vizda, J Horacek, S Spitalnikova,	The Journal of Laryngology & Otology, Volume 127 Issue 4, pp 432-434. P G Ciabatti, G Burali, L D'Ascanio,	The Journal of Laryngology & Otology, Volume 127 Issue 4, pp 435-437. N Eze, G A Morrison,	The Journal of Laryngology & Otology, Volume 127 Issue 4, pp 438-439. Elfy B Chevretton, Sherif Haikel, Ann Sandison, Steve Connor, Ata Siddiqui,	The Journal of Laryngology & Otology, Volume 127 Issue 4, pp -.